This beautifully handcrafted rustic chalkboard will upgrade and enhance any venue. Whether you're looking to draw customer attention to your business or welcome guests at your wedding reception, this board is perfect! We hope you love your board as much as we do! Please be sure to read the instruction page included to learn how to properly care for your board. BEAUTIFULLY HANDCRAFTED - Each of our A Frame Magnetic Chalkboards are handcrafted with care and attention to detail and design. Our solid Russian Pine wood guarantees the sturdiness and consistent aesthetic beauty of the design. Our wood is hand selected to guarantee our quality. RELIABLE STURDY DESIGN - Our solid design and construction enables our boards to withstand winds that others can't. Heavy Duty hinges help your A Frame last longer. The Double sided rustic chains enhance stability and authentic rustic style. Our high quality Russian pine wood makes our chalkboard signs sturdier and more durable. MAGNETIC CHALKBOARD SURFACE - Enjoy the added bonus of having a magnetic surface for pictures, menus, notes, and more! Our chalkboards are made of the highest quality Magnetic Porcelain Steel and are 100% non-porous. We guarantee that it will clean up perfectly every time without any ghosting! It also works perfectly with regular chalk as well. WORRY FREE PURCHASE - We pride ourselves with a 100% Customer Satisfaction Guarantee. We are confident in our products and stand behind them. Just reach to us with any questions or concerns and we will be happy to help! We are also backed by Amazon's A-Z Money Back Guarantee so your purchase can be worry free. 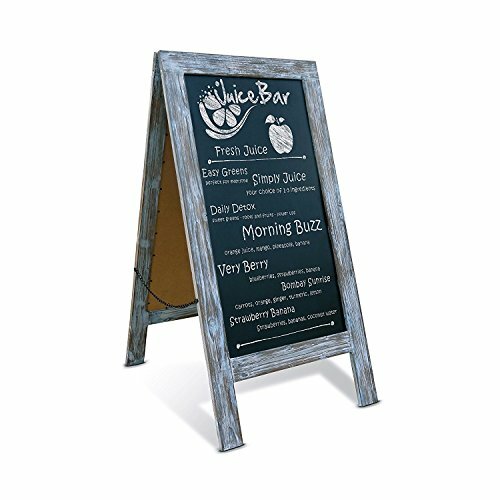 THE PERFECT CHALKBOARD - Great to use for menus or promotional messages outside your store, pub, or cafe. Also great for wedding receptions, birthday parties, baby announcements, family gathering,sales, and more!